Each initiative below summarizes and explains related policies the City and its partners will pursue in order to accomplish goals related to economic development. Click on the initiatives below to view full explanations and related policies. 1: Facilitate commercial and industrial development to grow and diversify our economy. We will create development-ready sites with access to infrastructure in strategic areas. Protects land appropriate for major employment development from short-term encroachment by other uses. Extends services and infrastructure to this land so that major employers can build with minimum delay. The Employment Reserve (ER) LUTA is specifically designed to preserve the integrity of land best suited for large-scale employment growth. Through the development approval process, the City can avoid compromising these sites by approving uses that will prove incompatible with future major employment centers. 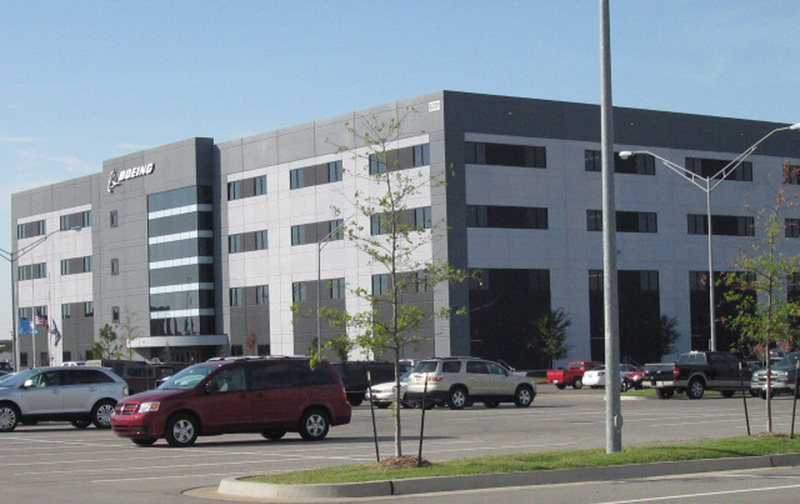 This may require creation of public or community-based development groups with the patience and ability to hold large assemblages of land for industrial, business park, or office headquarters uses. The other leg of the strategy involves preparing this land for timely development by financing and installing (or being immediately prepared to install) infrastructure. Accomplishing this will require mobilization of existing agencies such as the Urban Renewal Authority, the Oklahoma Industries Authority, and the Oklahoma City Industrial and Cultural Facilities Trust. It will also require establishing a reliable and repeatable method of funding capital investments that may include tax increment financing, general obligation limited tax bonds, and other public sources. Industrial and employer clusters whose requirements are matched to our attributes and who move in the direction of greater economic diversification. These natural affinities for Oklahoma City include aerospace, aviation, defense, bio-science and other high-technology industries, renewable energy, new-to-market company headquarters, and advanced manufacturing. Sites where major community investments have been made in land, infrastructure, amenities, and other capital improvements; major redevelopment areas; or other desirable sites where these facilities are already available. We will update public incentive programs to provide maximum leverage per dollar spent. The City provides incentives to businesses through its Strategic Investment Program. This incentive structure will be reviewed and optimized to provide the greatest community benefit and return on investment. This update should include specific evaluation criteria and objective measures of benefit. Preferred investments should move in the direction of private, front-end investment with incentive reimbursement tied to meeting performance criteria such as job creation and greater retail activity. We will support locally-owned businesses and existing assets. Locally-owned businesses can have greater multiplier effects on the local economy than similar businesses that are non-local. 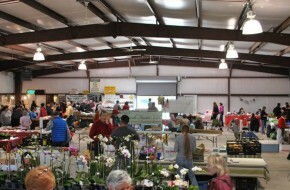 This includes even the smallest businesses, such as home businesses, mobile food vendors, pop-up retail or vendors at farmer’s markets. The City can support locally-owned businesses and entrepreneurs through favorable tax policies, flexible regulations, and partnerships with local educational institutions to support business incubators and other programs that encourage business start-ups. We must also look carefully at measures that level the playing field among retail entities and allow local retailers to compete on at least an equal footing with on-line and out-of-city competitors. Click to expand policy information. Strengthen existing businesses and business districts within and adjacent to established residential areas. Promote the development of new businesses to provide additional jobs and higher income opportunities for nearby residents. 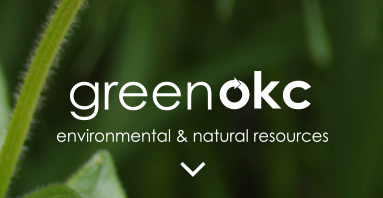 Task the Oklahoma Industries Authority (OIA) and/or the Oklahoma City Industrial and Cultural Facilities Trust (OCICFT) to help public and private entities create development-ready sites. Partner with the State School Land Trust to prepare their sites located in ER areas for development. 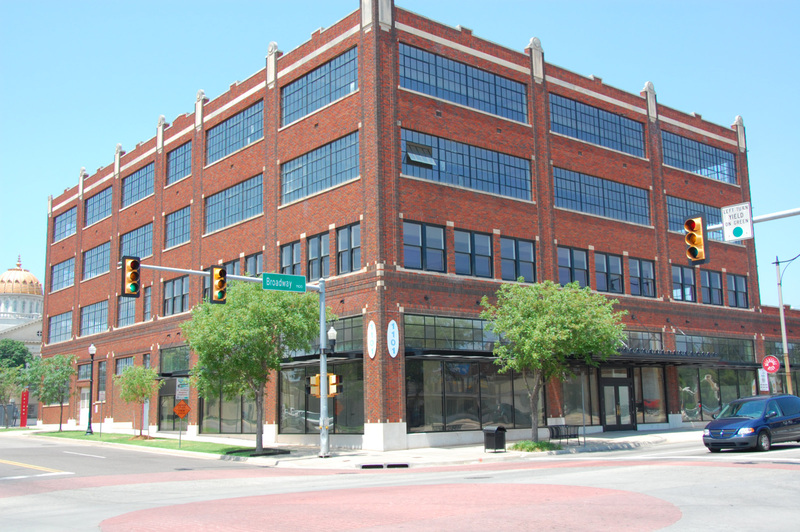 Pursue public purchase or optioning of key properties in ER areas in cooperation with the Urban Renewal Authority, the Oklahoma Industries Authority (OIA), and/or the Oklahoma City Industrial and Cultural Facilities Trust (OCICFT). Conduct a market analysis and feasibility study for a new business park. Provide adequate infrastructure for new or expanding companies by giving priority to Capital Improvements in ER areas. Additionally, consider the implementation of impact fees for infrastructure in order to provide infrastructure in a timely manner and to better coordinate with private development. The prospective company pays for infrastructure and/or amenities and is reimbursed by the City as performance standards are achieved. The City pays for infrastructure and/or amenities, which the prospective company must repay if performance standards are not met. Direct, performance-based payments are made to the prospective company. Establish online sales taxes to correct a competitive imbalance currently suffered by local “brick and mortar” merchants. Facilitate entrepreneurial growth by working with local companies and universities and supporting business incubators. Consider amending the Strategic Investment Program guidelines to give higher priority to locally-owned businesses. Consider creating incentives and/or easing regulations for small, locally-owned businesses such as home businesses, farmers’ markets, mobile food vendors, pop-up retail, etc. When major infrastructure is extended to allow specific properties to develop in an Employment Reserve area, the City should place a condition on the land (through a development agreement) limiting future development to employment uses. Guide employment land development through the proactive and strategic installation of infrastructure to accomplish the large-site employment land inventory objectives outlined in the Employment Land Needs Assessment & Action Plan. 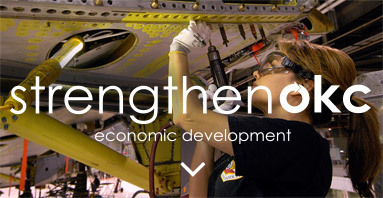 The City will support development of industry clusters in areas such as aviation and defense. 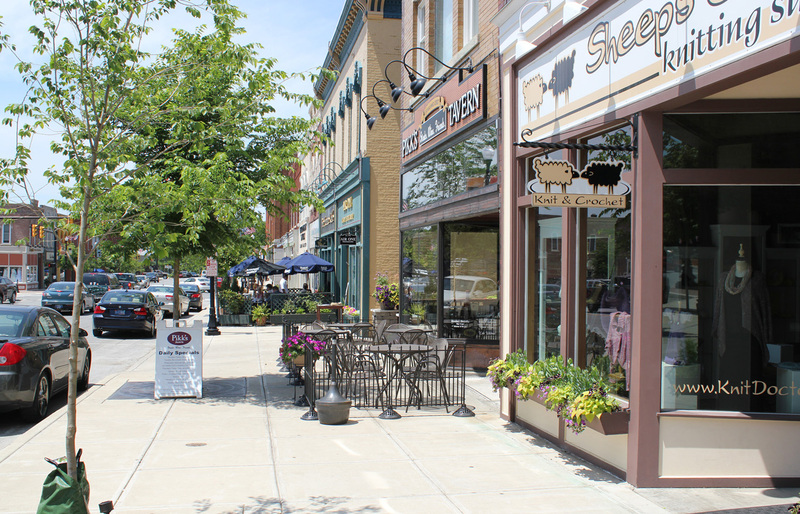 Locally-owned businesses provide multiplier effects to the local economy. 2: Boost educational achievement through incentives and neighborhood diversification. We will support our schools in improving student performance. Low academic performance is a problem in our city, and especially within Oklahoma City Public Schools, as measured by the State Department of Education. Our entire community must address this issue aggressively. Some solutions involve long-term and continuing efforts, such as creating and sustaining healthy, mixed-income neighborhoods that provide the secure environments necessary to nurture learning and achievement. 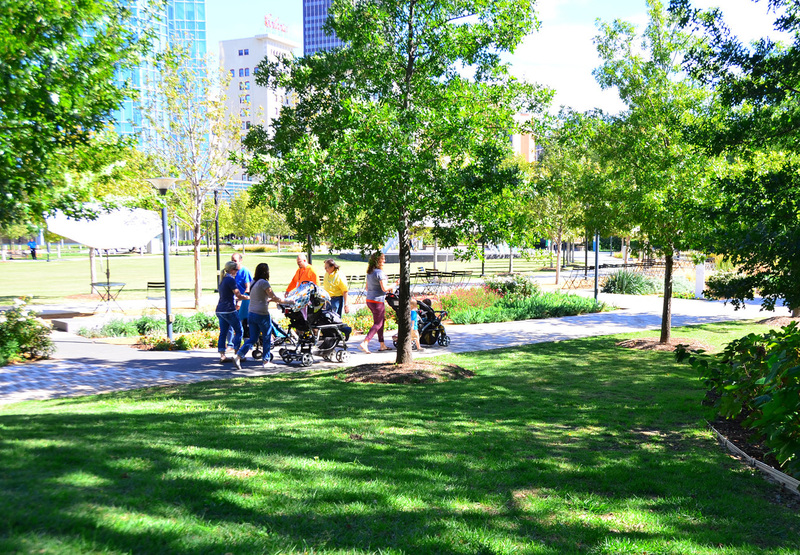 Recommendations that help create these types of neighborhoods are found throughout planokc, from land use initiatives to neighborhood reinvestment and housing variety. Other specific efforts, involving concerted action by the public and private sectors and school districts can provide more immediate results. These educational support programs can include scholarship programs that offer post-secondary grants to students in inner-city schools and districts, expanded early childhood education, after- school programs, mentoring, specialized educational tracks, teacher skills training, or financial incentives for high-performing schools and teachers. The City will also assist the Greater Oklahoma City Chamber of Commerce in efforts to adapt the education and training offered by local institutions to match the current and future needs of local companies. This includes both K-12 schools and secondary schools. Educational issues and programs represent a convergence of different perspectives. 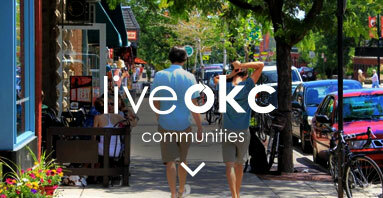 This element approaches good educational programming from a workforce and economic development framework; liveokc from a neighborhood development viewpoint; and serveokc from a public service and community quality point of view. However, all point in the same direction, highlighting the importance of increasing achievement and learning. Facilitate communication among the 23 school districts in order to develop more arts education opportunities for the children in our community. Establish development standards and design guidelines for new cultural, civic, and sporting facilities that address site design, architecture, compatibility, pedestrian-orientation and access, landscaping, and the inclusion of public art. Other projects or programs that improve neighborhood safety by working with children. Coordinate with Strong Neighborhoods Initiative to provide recreational, fire safety, public safety, and character building programs in schools. Identify ways to establish/strengthen relationships and partnerships between schools and the business community as one method to improve student education and outcomes. Encouraging school districts to open schools and school grounds after school hours to support community engagement and more convenient opportunities for active recreation. Work with the Greater Oklahoma City Chamber of Commerce to recommend adaptations to local education and training opportunities to match the current and projected needs of local companies. Encourage redevelopment and infill development on vacant, underutilized, and brownfield sites in urbanized areas. Identifying and removing barriers to rehabilitation and/or replacement of residential buildings. Establishing a position in the City to facilitate medium- and large-scale redevelopment projects through the development process by guiding interactions with City departments, allied agencies, and utility companies. Encourage the adaptive reuse of underutilized structures and the revitalization of older, economically distressed neighborhoods. Support diversity and integration of housing unit types and sizes in all land use typology areas in order to meet the diverse needs of households of different sizes, generational needs, incomes, and preferences. 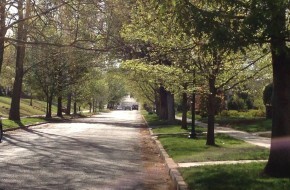 New residential subdivisions should achieve a mixture of housing types within a unified development. Amend the zoning ordinance to better accommodate the integration of various residential densities, building types, and styles. We will develop new site and building design guidelines and regulations and increase property maintenance standards and enforcement. Better community appearance is largely based on raising people’s expectations of how they should both develop and maintain their own property. New standards will establish better minimum expectations for how buildings and sites should look and function. These new standards should not add burdens or excessive costs, but should establish new basic assumptions about how we build, whether our projects are small convenience stores or a large mixed use developments. We often judge community appearance by the routine rather than the unique. The same holds true for private property maintenance. Maintenance quality is contagious – care produces more care, and neglect produces more neglect. Again, our standards, technical assistance programs, and ultimately enforcement should move toward a higher level of care in our own individual environments. We will improve the appearance of our streets. The public environment, all too often viewed as nobody’s responsibility, should in fact lead the way in creating upgraded appearance standards. 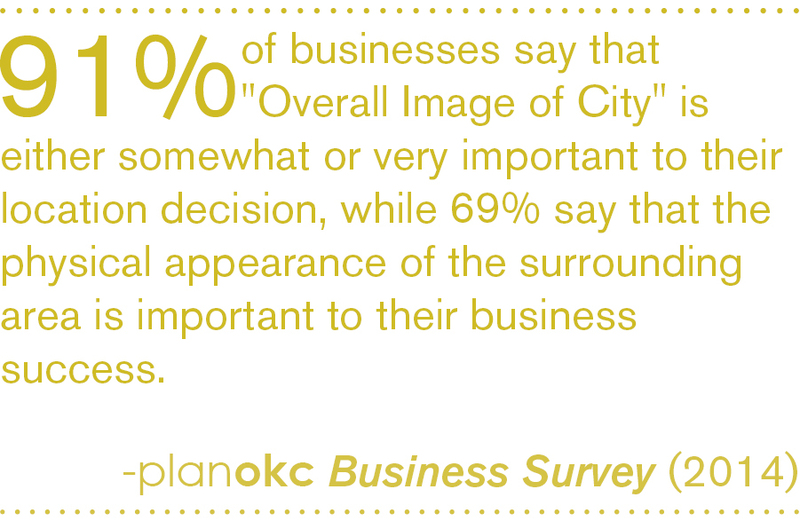 In the planokc Business Survey, local businesses overwhelmingly cited “improving the appearance of major commercial streets” as the most important way to improve the appearance of the city. After 2007 Bond Election resurfacing projects are complete, the City will assess the need for additional funds for citywide road maintenance beyond average annual expenditures. The assessment will be based on citizen satisfaction surveys, traffic volumes, and street condition data maintained by the Public Works Department. The City will also explore the feasibility of burying existing utility lines where possible and requiring all new utility lines to be buried. These efforts toward improving the quality of basic street appearance will continue and will encourage adjacent property owners to follow suit. We will reduce litter and graffiti. The City will enhance litter and graffiti control through public awareness efforts and stricter laws and enforcement. Active code enforcement should be increased in targeted areas, including retail plan areas, special districts, and areas that are part of the Strong Neighborhoods Initiative (SNI). We will reduce the impact of sign pollution. The City will update the sign code to reduce the visual impact of signs. Good standards actually improve readability and communicate business messages better than a cacophony of competing signs. The City can also explore reduction of sign pollution through amortization (gradual elimination as the service lives of signs expires) of existing signs that do not conform with new requirements. Restrict new billboards and eliminate or reduce the number of existing billboards. Require non-conforming signs to be removed or be brought into compliance with existing regulations within a specific timeframe. Consider new standards in the Sign Ordinance to improve limits on the size, height, and number of signs. Improve proactive enforcement of the City’s sign regulations to curtail the placement of illegal signs and ensure adequate maintenance of signs. Provide assistance to residents to make housing and neighborhood improvements and provide training in property maintenance skills. Develop and organize volunteer programs (such as adopt-a-street, adopt-a-park, and neighborhood clean-up days) and/or coordinate efforts to obtain grant funding to establish community clean-up programs in neighborhoods where inadequate property maintenance is prevalent. Publicize Bulk Waste Days and/or explore the possibility of adding more days/increased frequency. Develop a list of outside funding sources that could be used for property maintenance and make this information available to all citizens, especially those in targeted low-income areas. Establish public educational programs and advertising campaigns to discourage littering. Education should begin at the elementary level and continue through the adult level. Implement stricter enforcement of property maintenance regulations and consider more significant penalties for violations. Increase emphasis on the enforcement of littering laws. Impose fines against littering in a uniform and consistent manner to reinforce a public perception that littering does carry a definite risk. Immediately report and ensure expedient removal of graffiti that is visible from interstate highways and other important/designated viewshed corridors. Incorporate natural features (such as ponds, lakes, streams, rock outcroppings, stands of mature trees, and/or sizable individual trees) into the design of all residential, commercial, and industrial projects rather than eliminating, hiding, or limiting access to those features. Develop and adopt new standards to minimize the detrimental appearance of accessory utility equipment (i.e. transformers, cable cabinets, telephone cabinets, utility meters, valves, etc.) by integrating them into less prominent areas of the site design or by screening them with landscaping, artistic features, or architectural materials compatible with the primary structures. If not encouraged, artistic embellishment (creating urban ambiance with imaginatively designed/painted screens) should not be prohibited. Ensure that such facilities are situated so that they do not impede pedestrian access. Facilitate and coordinate burial of overhead power and communications distribution lines. Develop standards/guidelines that require architectural articulation, variety, and interest on large structures adjacent to public streets by limiting long stretches of unbroken wall planes. Use light fixtures and street furniture in the public right-of-way that complement established or evolving cultural or design districts. Establish a funded beautification program and source of funding to provide facade and landscaping enhancements along targeted industrial corridors. Utilize best management practices or other low-impact development methods for storm water management. Bring buried streams to the surface and restore riparian habitat. Install bridge systems instead of culverts for stream crossings to help maintain the natural ecosystem associated with the stream. Require removal of invasive species from existing sites, and prohibit such species from being planted or maintained in new development. 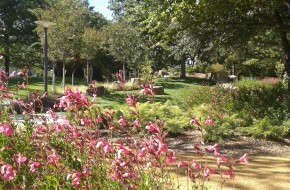 Provide a reference list of native plants and drought-tolerant plants. Provide incentives for using native and drought-tolerant plants and disincentives for using high-water plants and turf grass. Establish requirements for using design practices that minimize the need for supplemental irrigation. Establishes penalties for unauthorized tree removal. Modify development and subdivision regulations, and City policies to minimize alteration of natural landforms and native vegetation and maximize retention of distinctive natural features for public and private projects. Preserve overall landscape character and natural landforms (rolling hills, native vegetation, etc.) to the greatest extent possible. Establish a program or series of programs that significantly improve the quality, appearance, and perception of rental housing throughout the city. Program components should include: 1) owner, manager, and tenant education; 2) code enforcement and inspections; 3) design standards/considerations that promote safety; 4) high attention to property maintenance; and 5) other relevant best practices. Quickly repair damage caused by vandalism, including graffiti, to minimize negative impacts on neighborhoods. Coordinate the efforts of existing programs, such as the Police Department’s Removal Unit, the Public Works Department’s Removal Unit, and Oklahoma County’s “SHINE” program to increase responses in targeted areas and expand the area which can be covered. Increase participation by the business community, such as donations of paint and time. Increase proactive code enforcement efforts, including litter control, and graffiti clean-up in targeted areas (e.g., SNI areas, and special districts). Require all new utility lines to be buried and bury existing utility lines when possible (e.g., when roads are widened). Package vacations that highlight the city’s amenities and destinations. Conduct a tourism market study and plan to identify opportunities to increase visitation from in-state and out-of-state groups and households. 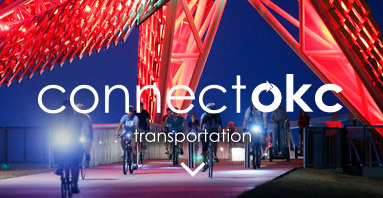 Publicize information highlighting the city’s amenities, destinations and transportation options (e.g., Spokies, transit, walking tours, and river boat tours). 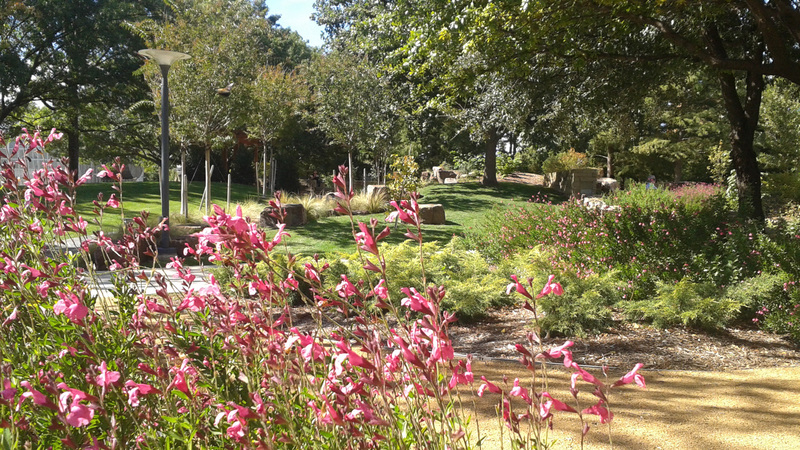 Direct visitors (through maps, walking, biking, and river tours, and driving and streetcar routes) to Oklahoma City’s cultural and historic sites, and commercial districts. Explore the feasibility of City-supported, high-quality landscaping along key transportation corridors as a means of enhancing the city’s appearance, image, and sense of place. Create gateways using public art features. Updating nuisance code to better address noise, smell, vibration, property maintenance, panhandling, animal control, delivery hours limits, and other possible negative effects. Updating the sign ordinance to reduce visual clutter. Commercial buildings should be built at the street rather than behind a parking lot in order to promote pedestrian circulation, multipurpose shopping trips, and walkable and attractive streetscapes. 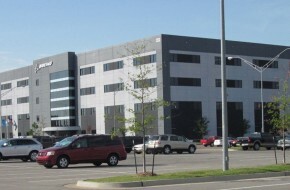 Large-scale commercial buildings with parking in front should screen parking lots with the coordinated development of out-parcels (pad sites) and with landscaping. 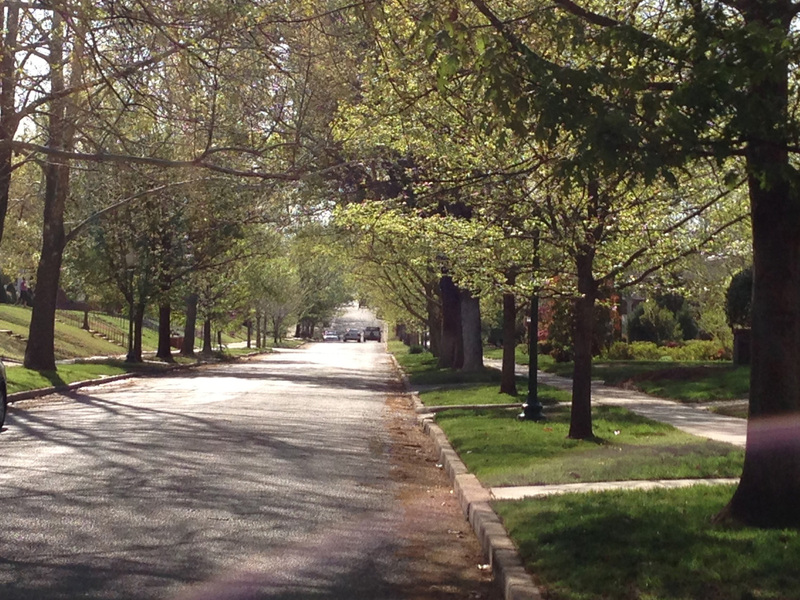 Amend the landscape ordinance to increase the number of trees and landscaped islands required in parking lots. Create design standards and guidelines for the design, materials, shared amenities, and accessibility of high density urban residential development. Standards and guidelines should promote privacy and livability in a high density, mixed-use environment. 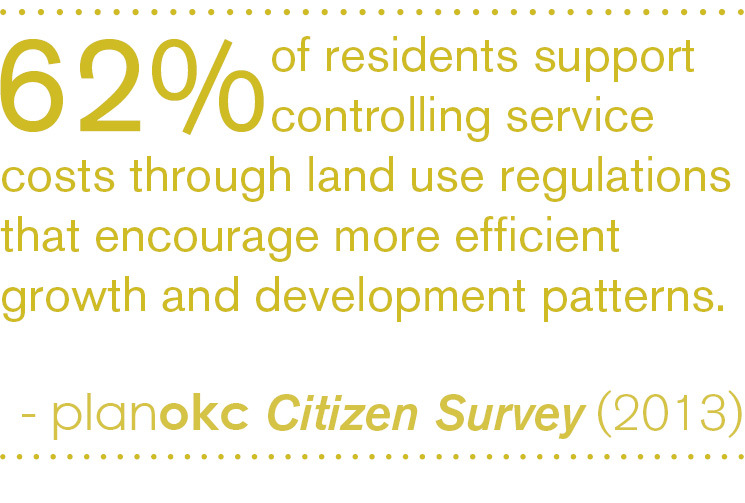 Providing a mix of uses within neighborhoods can increase resident's access to jobs, housing, and daily needs. These special urban districts also attract new businesses and creative enterprise. 4: Invest in place-making efforts in special districts and throughout the city. We will continue to create and enhance amenities such as parks, roadways, transit, cultural and recreational facilities, special districts, and gateways. The MAPS programs have generated tremendous momentum for our city, but we cannot rest on past accomplishments. Instead we must continue our efforts to create great places at neighborhood, citywide, and street levels. In the future, these amenities will include public spaces, street corridors, transit facilities, cultural and recreational attractions, special districts, and community gateways. 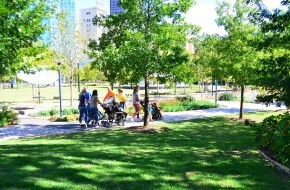 Connections like the Bricktown Canal connecting Bricktown and the riverfront, the SkyDance Bridge, the riverfront greenway and in the near future the modern streetcar and trails projects have been as important as individual destinations. Signature transportation corridors are also vital parts of the cityscape. To this end, the City will explore the feasibility of installing and maintaining landscaping and public art along key transportation corridors to enhance the City’s appearance, image, and sense of place. Features like gateways can mark the transition from one district to another, and help emphasize the distinctiveness of Oklahoma City’s special districts. We will build on the success of our special districts to attract residents and businesses. Downtown, Bricktown, Midtown, the Plaza, Deep Deuce, the Paseo, Stockyards City, Automobile Alley, Heritage Hills, and others are important districts that contribute strongly to Oklahoma City’s sense of place and identity. 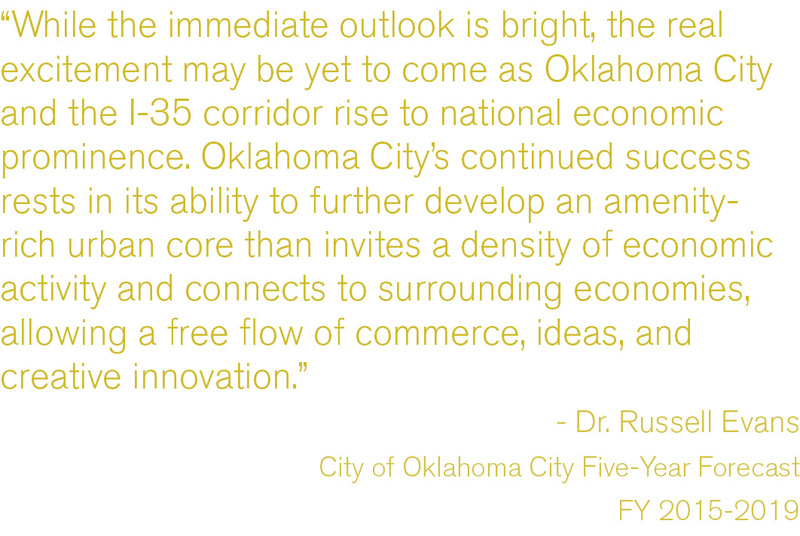 Future districts like Core to Shore will contribute to Oklahoma City’s collection of urban places. The City will continue to invest in features that make these existing and future places centerpieces of our community by catalyzing development, increasing land use diversity, building quality of life amenities, and promoting family-friendly features. Catalyzing development. Urban housing has proven to be a staple of downtown and urban district revitalization. Residential development not only creates a market for more local services but also creates a comfortable environment that brings other people in from around the city and region. The City will continue to guide housing development to urban districts to increase activity and support demand for new retailing. Special focuses will include Downtown and surrounding areas and the new Core to Shore neighborhood. The City should also place a priority on establishing a signature retail development or a retail/housing mixed-use development. Diversifying land use. 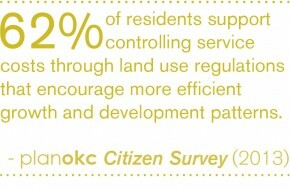 Increasing land use diversity in urban districts will help attract and retain visitors and support development momentum. For example, Bricktown’s first development phases concentrated on offices, bars, and restaurants. But the historic district has become more vital with nearby housing, retailing at different scales, and hospitality uses, and this type of diversification should accelerate. In special districts, City policy should attract a balance of retail, residential, employment, and recreational uses. Investing in amenities and activities. The City can strengthen downtown’s and other districts’ senses of place and increase activity by encouraging and investing in more public plazas, public art, parks, indoor recreation facilities, and arts and cultural facilities. Building family-friendliness. We can help attract and retain a variety of households to downtown and other urban districts by promoting and enhancing them as family-friendly places to live and play. Attention to street design, land uses (particularly around the downtown school) and public safety can help promote this image. We will establish a place-making program. The City will establish a program to develop place-making capacity in the city and promote both the economic and quality-of-life value of place-making investments. The program will establish partnerships and provide funding on a regular basis, including attention to small, neighborhood-scaled projects. 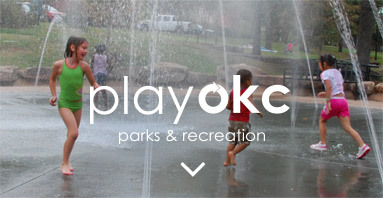 A significant part of this program is communicating the message of Oklahoma City’s places to the outside world. This both benefits businesses directly through promotion and supports city marketing and talent recruitment efforts. 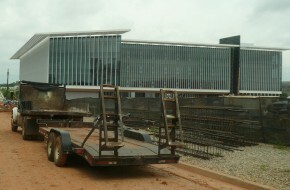 The Chamber of Commerce and Convention and Visitors Bureau are major partners in this effort. We will designate additional special districts. The City will foster more specialized districts for large cultural or ethnic groups to promote diversity and improve perceptions of the city. For example, Capitol Hill could grow as the center of an emerging Hispanic/Latino district, with appeal to people throughout the region. New special districts would include thematic infrastructure, amenities, design, public art, and streetscape improvements. Appropriate areas should be identified for special districts, followed by preparation of plans that establish design guidelines and strategies to capitalize on cultural meaning. Provide tools and incentives for targeted housing and neighborhood revitalization through programs such as a housing trust fund, land bank, abatement of permit and connection fees, employer assisted housing, inclusionary housing development, tax abatements, credits or deductions, abatement of permit and connection fees, and an expedited review and approval processes. Create regulations/standards/guidelines that focus on design and/or compatibility principles which are sensitive to the surrounding urban form, especially in areas that are stable or improving and whose character is well-established. These provisions should also help ensure compatibility between lower- and higher- intensity land uses. Establish and maintain partnerships between the City, the private sector, and “place management” organizations. Provide funding and City staff support for “place management” organizations. Create specialized districts for large cultural or ethnic groups to enhance the diversity and perceptions of the city. Identify appropriate areas and create master plans with urban design guidelines specialized to the cultural history on display. For example, one special district could be themed for the Hispanic/Latino community. Such a district would include associated thematic infrastructure, amenity, design, public art, and streetscape improvements. Adding family-friendly public amenities including parks, open space, greenways, plazas, bikeways, public art, etc. Ensuring new buildings and sites are designed to be attractive and to enhance safety and the sense of safety. Attract and retain young professionals to downtown and its environs to support and enhance place-making efforts and investments. Explore the possibility of the Greater Oklahoma City Chamber of Commerce contracting with the City to facilitate and promote civic engagement and social opportunities for young professionals. 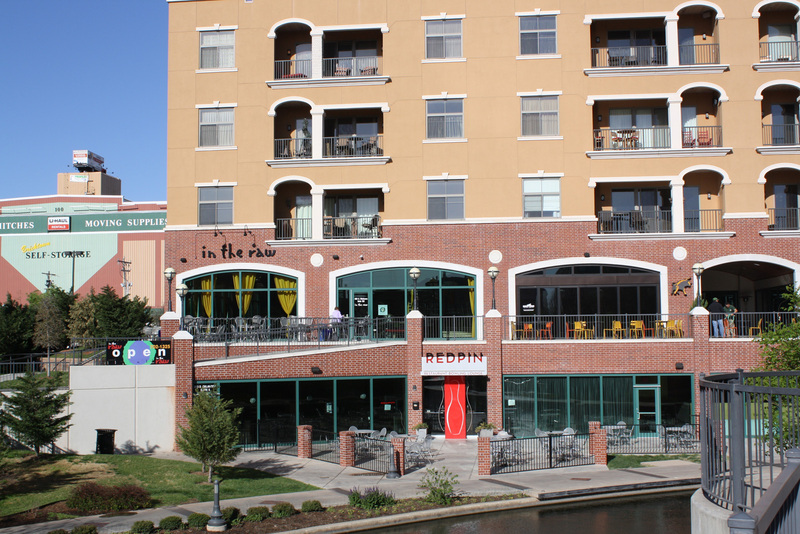 Facilitate the development of housing in the Downtown, Bricktown, and Core to Shore areas in order to increase activity levels and demand for retail and amenities. Strengthen downtown’s sense of place and activity levels by encouraging more housing, retail, public plazas, public art, parks, indoor recreation facilities, and arts and cultural facilities. 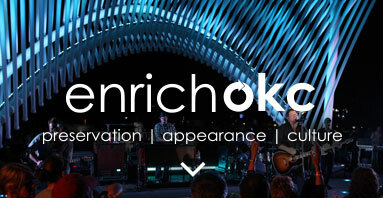 Increase land use diversity in Bricktown to attract and retain visitors and development momentum. Specifically, encourage more retail, office, and recreational uses rather than additional bars and restaurants, so that visitors of all ages and interests will be motivated to visit and stay longer. Encourage the use of special service districts with enhanced levels of service. Ensure adequate funds to maintain enhanced levels of service (including staffing) in places that have been or will be designated as special districts. Coordinate with the Greater Oklahoma City Chamber to advertise the city’s quality of life to national and regional audiences during major events such as the NBA playoffs, and at other appropriate times and places, and in appropriate media. Create and implement small area plans for neighborhoods or districts with special strategic importance or complications related to development or redevelopment. 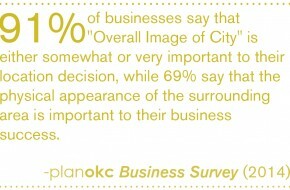 Enhance Downtown Oklahoma City’s prominence by maintaining and increasing its role as the major business center, establishing it as a major urban residential center, and focusing on developing retail, office, entertainment, and arts and cultural uses. 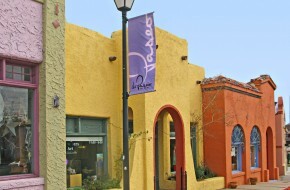 Work to establish a critical mass of retail uses in the downtown area. 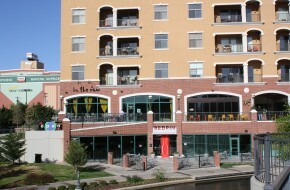 A lifestyle center or mixed-use town center presents the most viable option for a major infusion of retail into downtown. 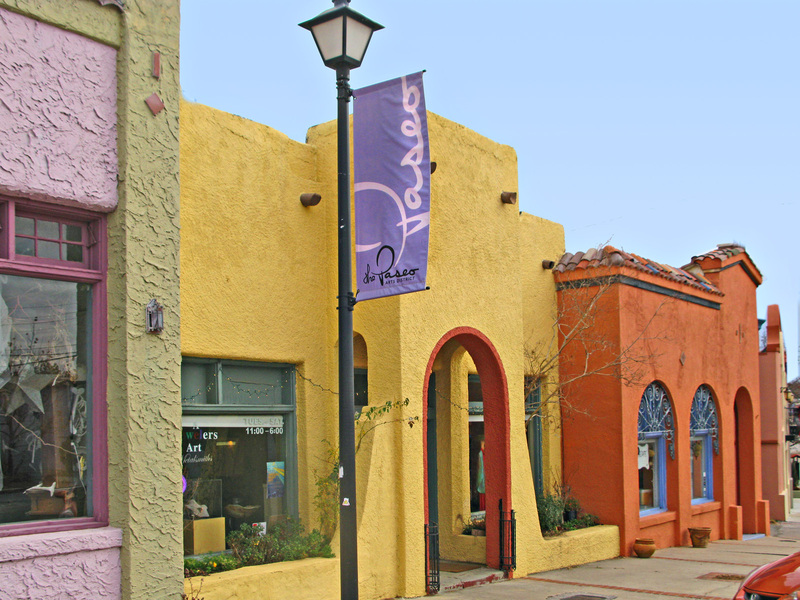 This long-time signature district continues as a visitor attraction and has continued to anchor its surrounding neighborhood and provide a center for small businesses and independent artists. Additional amenities and housing for all types of households in the downtown area will help maintain momentum. 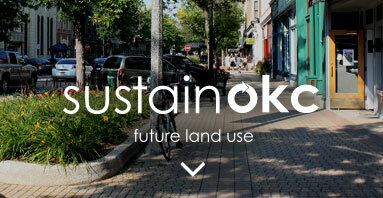 5: Foster stable, attractive neighborhoods and commercial districts through infill and good design. We will promote redevelopment of vacant or under-used sites. Infill development on vacant, under-utilized, and brownfield sites should receive special attention through changes to land use regulations, infrastructure upgrades in target neighborhoods, incentives, favorable tax policies, expedited processing, and greater flexibility. The City recently produced a study on vacant and abandoned buildings to help address this issue and will continue to pursue implementation of the recommendations of that study. We will encourage diversity in our neighborhoods. The City should use its housing and land use policies to encourage neighborhoods that have a diverse range of home sizes and types, and avoid concentration of low income households. Diversity builds unique and resilient neighborhoods, increases community involvement, and expands support for neighborhood schools. From an economic development point of view, housing and price-point diversity provides solid, affordable residential areas for members of the labor force at all levels of income and tends to encourage upward mobility. We will support the Strong Neighborhoods Initiative. The City should continue to support the Strong Neighborhoods Initiative and consider permanent funding for the Neighborhood Stabilization Program to help reverse decline and create valuable places. We will require good neighborhood design. Good neighborhood design can increase citizens’ access to jobs, housing, schools, and daily needs. It will also contribute to positive perceptions of neighborhoods, thereby encouraging investment. New citywide site design and building regulations should establish basic functional requirements for features that produce good urban places. These include encouraging active transportation; integrating residential areas and activity centers; implementing good basic standards for signage, building materials, and site planning; and developing public spaces designed for desirable person to person contact. Support and incentivize the adaptive use of existing buildings, infill development, and brownfield development. Integrate housing rehabilitation programs with neighborhood revitalization programs. These programs should include assistance to property owners to renovate the existing housing stock with improvements that reduce utility and maintenance costs for owners and occupants, conserve energy, conserve water, and reduce greenhouse gas emissions. Identify, evaluate, and mitigate challenges associated with neighborhoods where housing values are rising quickly in response to public investment. Establish new or expand existing financing methods and/or mechanisms available to new and redevelopment mixed-income projects in urban areas. These could include: direct investment of public housing funds, tax-increment financing, bonds, revolving loans, housing program funds and/or other proven public-private partnership models. Create and/or enhance Community Development Corporations (CDCs) and Community Housing Development Organizations (CHDOs) to increase their capacity to provide mixed-income housing, especially in targeted infill areas. Catalyze the rehabilitation of abandoned structures by amending codes to facilitate the adaptive reuse of existing buildings for residential use. Develop a City program to rehabilitate or redevelop dilapidated properties, including a land bank to receive donated properties from property owners who can no longer maintain their properties. 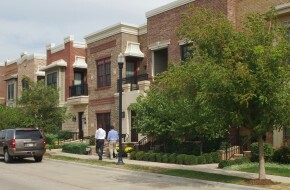 In conjunction with City regulatory changes, such as significant modifications to zoning ordinances, building codes, or subdivision regulations, assess the effects of the proposed modifications on housing development costs and overall housing affordability, considering the balance between housing affordability and other objectives such as environmental quality, urban design quality, maintenance of neighborhood character and protection of public health, safety and welfare. This assessment should be integrated into the code amendment process, identify barriers to housing affordability, and include recommended mitigation. Strengthen the City’s ability to obtain specific performance of property owners cited for code violations. Speed up the demolition process for long-time boarded properties that cannot be rehabilitated. Strengthen the City’s ability to require property owners to rehabilitate or sell neglected, boarded-up properties. Expedite the clearing of properties involved in probate. Improve parking provisions in neighborhoods that are near vibrant commercial corridors/areas by improving parking and corridor design, non-vehicular networks, transit, and signage. Strategically use subsidized housing programs along with other City services and programs to revitalize targeted areas of the city. Study the impact of vacant parcels on places and special districts, and determine how best to mitigate any negative impacts. Offering temporary or short term catalyzing incentives for the first “infillers” in target neighborhoods. Incentives may include small grants and/or low interest loans from a revolving loan fund or for property improvements. Evaluating the possibility of basing property taxes on only land value and not improvements, thereby encouraging high intensity use of well-positioned land and discouraging underutilization and long–term vacancy. Rather than rely solely on federal CDBG funding, seek other sources to continue to support the Strong Neighborhoods Initiative and Neighborhood Stabilization Program in order to enhance their ability to reverse decline and create valuable places. Adopting and supporting new local and state laws to increase consumer protection for condos and townhomes (e.g., better funding mechanisms and maintenance enforcement for common areas). Requiring developers to demonstrate sustainable funding levels for common area and facility maintenance costs. Continue promoting the re-use, redevelopment, and revitalization of low-performing or declining commercial areas. Preservation of Environmentally Sensitive Areas. Regulations could be based on a point scale to allow flexibility, while still requiring basic minimum thresholds be met. New regulations should remove the existing requirement for development in Rural LUTAs to connect to water and sewer systems and establish a minimum one-acre lot size for lots with on-site sewer treatment. New infill housing in urban core neighborhoods create positive momentum for neighborhood revitalization. We will reduce crime and improve the sense of security throughout the city. We will establish and expand crime prevention partnerships with neighborhoods, visible patrols with a high degree of community contact and interaction in targeted areas, and youth programs. Other components of this effort should include regular evaluation of police staffing needs and expansion of such preventive measures as elimination of nuisances like abandoned buildings and integration of Crime Prevention Through Environmental Design in the project review process. 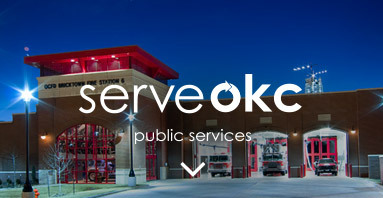 The liveokc and serveokc elements also provide initiatives that address public safety issues. Developing and/or enhancing community policing programs, which involve residents and businesses in crime prevention strategies. Increasing business presence and participation in community policing. Increasing opportunities for the Oklahoma City Police Department community relations officers to interact with community organizations, neighborhoods groups, schools, recreational and/or athletic programs. This interaction should include increasing resources to allow real-time communication of safety concerns with these organizations. Education and job training for at-risk youth. Community involvement programs such as Light Up The Night, Neighbors Night Out, and other similar activities and programs designed to strengthen neighborhoods. Target specific areas of the city for enhanced safety and proactive enforcement. Selection of target areas will be informed by the Intelligence Led Policing program, with coordinated involvement from Police, Code Enforcement, Public Works Department, Planning, and community-based organizations. Supporting partnerships between the police, property managers, property owners, and tenants. Providing training to managers and owners about screening applicants, fire safety, fair housing, and other components of ‘active property management’. Providing a security assessment based on Crime Prevention Through Environmental Design (CPTED) principles. Conducting safety meetings with residents/tenants. Providing good lighting, emergency call boxes, and regular police patrols along the trail system. Providing shelter structures along the trail networks and determining the appropriate spacing for such structures. Structures could be relatively small to keep costs down but should be sturdy and easy to maintain. Incorporate Crime Prevention Through Environmental Design (CPTED) principles into city-wide design standards for development and redevelopment of public and private projects. CPTED principles include: 1) Territorially – physically define spaces as public or private and the appropriate use is obvious even to outside observers; 2) Access Control – deny access to soft targets; 3) Natural Surveillance – make it easy to observe all users of/in a particular territory/space; 4) Maintenance and Management – ensure equipment is functioning (lights, gates, etc. ), landscape is kept neat especially to preserve surveillance. Evaluate development proposals to assess design components that contribute to or detract from safety and analyze emergency response capacity and capability. Ensure resources and funds remain dedicated to crime prevention programs, including but not limited to: block watches; graffiti removal; education and outreach associated with elder fraud, identity theft, and sexual predators; safe driver programs for automobiles, motorcycles, and bicycles; after-school and youth diversion programs that provide recreational and educational support (tutoring, homework help, etc. ); and other crime prevention programs. 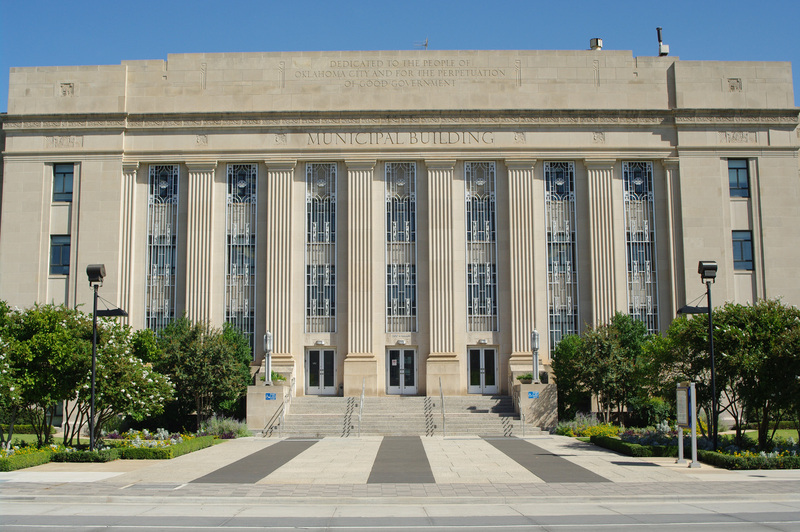 Ensure planokc is maintained to support and reflect the City’s priorities to provide a safe and secure community. Reinforce existing partnerships and create new partnerships with allied agencies and non-profits to intervene early and often with at-risk youth redirecting them from participation in criminal activities to educational opportunities, job training, community service projects, neighborhood and business improvement programs, and other community building projects and/or programs. Adopt design standards to enable emergency management resources to be highly effective, such as resilient buildings, interconnected transportation networks, and other design considerations that help ensure community safety and recovery. Supporting efforts to obtain more effective criminal justice law, such as stricter gang laws. 7: Increase efficiency of city services provision. We will improve efficiencies in City operations and in providing public services through efficient growth. Increased efficiency follows two tracks. First, basic City operations should provide maximum value to the taxpayers per dollar spent. Second, the city’s growth should be economical and efficient so that it contributes to rather than detracts from fiscal stability. Maximizing efficiency in City operations means establishing and maintaining appropriate staff levels and ensuring that staff is fully utilized; introducing technology and other innovations; avoiding duplications through information sharing and consolidation of functions where possible; and increasing cost recovery where possible by establishing fees and charges that reflect the actual cost of services. 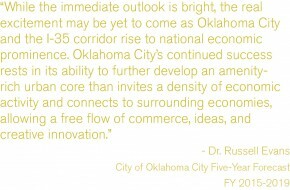 Maximizing the benefits and efficiencies of growth is a primary theme of planokc, and is reflected throughout this document. While a comparison of the three development scenarios and preference for the “efficiency” scenario as the future growth model has many benefits, the choice is ultimately economic. The efficiency scenario accommodates the same amount of growth for $82 million less per year than continuing present trends. New techniques of financing development such as impact fees should also be considered to ensure that future development pays equitably for the cost of infrastructure that it demands. Existing capacity to support the revitalization efforts; and other important indicators. Covenants requiring compulsory membership in an incorporated Property Owners Association whose members will be financially liable for any such maintenance, repair, or reconstruction costs. Incorporate these financing options into the platting process (or zoning process in the case of PUDs). Construct all private roads and utilities to comply with minimum design and paving standards as outlined in the City of Oklahoma City Subdivision Regulations, including those related to the appropriate Street Typology. Evaluate public facilities and public property for unsafe conditions such as poor lighting (quality and quantity); blind spots; poor maintenance conditions; and other unsafe conditions. Prioritize improvements to these facilities and properties based on the following criteria: a) Proximity and condition of nearby neighborhoods; and b) Cost/benefit associated with mitigating the unsafe condition and maintaining the improvement. Continue to ensure that rates to wholesale customers, for example, nearby jurisdictions, are based on up-to-date cost of service studies. 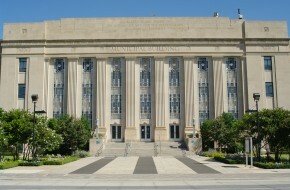 Form a working partnership with the library system, both the Metropolitan Library System and the Oklahoma Department of Libraries, to coordinate timing of facility expansions, improvements, and new facility siting with other types of civic resources, such as schools, fire stations, parks, and projected growth and demand for those resources. This should also include identifying a mechanism to provide library services in Canadian County. Support annexation or deannexation actions that improve City service efficiency; improve fiscal sustainability; and/or contribute to regional goals related to transportation systems or environmental resources. Locate, design and upgrade City facilities and infrastructure in a manner that supports neighborhood revitalization and redevelopment. Prioritize street maintenance projects in the Capital Improvement Plan based on the Public Works Department’s street condition data and traffic volumes. To the extent possible, base fees and charges on the cost of services and goods provided depending on location. Investigate and implement technological approaches to improving local government efficiency and service quality. Implementing an impact fee structure that varies by district according to actual cost. Studying the impacts of altering the pricing of utilities to factor in how the location of a user impacts the cost of providing them utility services. Exploring the use of fee-based revenue methods for maintaining infrastructure, such as transportation facilities, utility systems, and other public infrastructure. Altering zoning ordinance and subdivision regulations to allow more efficient development patterns. Prioritize and concentrate development where facilities, infrastructure, and services have capacity and in areas where the Police and Fire Departments are best able to respond. Guide the location and timing of development through the proactive and strategic installation of infrastructure. Ongoing master planning to determine the necessary water, sewer, and road infrastructure to serve development. An impact fee system that collects funds for specific areas as they develop and installs needed infrastructure in a timely manner. Use of special service districts to ensure appropriate levels of service, sufficient revenue, and timely installation of infrastructure and facilities for each district. Require developers to construct or fully fund infrastructure or other improvements needed to serve their development, with reasonable accommodation for future adjacent or nearby development. Require developers to wait until the City (or the State as the case may be) constructs the infrastructure needed to serve their development. For development proposed in areas not currently within one-half mile of existing water infrastructure, require a service area study to first be completed to determine the best method for providing water to the service area. For development proposed in areas not currently within a sanitary sewer drainage basin, a drainage basin study should first be completed to determine the best method for sanitary sewer service. Enhance transit service (bus and rail). Prevent large areas of concentration of any particular land use such as multi-family or commercial. Prioritize maintaining the strength of existing commercial nodes and corridors over providing new areas for commercial development. Private solid waste services where it is impractical for the City to provide service such as in rural areas. 8: Increase and stabilize tax revenues. Reduce leakage of local consumer dollars to other jurisdictions and non-taxed sellers. Import consumer spending from outside by providing unique destinations and retail environments. Increase sales through community growth and investment. Require on-line sales to compete on an equal basis with brick and mortar sales. We will increase the City’s property tax revenue by increasing property values. Many planokc initiatives involve reinvestment, neighborhood stabilization, and efficient growth policies that will ultimately raise property values. This is good for both property owners and the public sector. For the former, raising values raises individual net worth and the stability of people’s investment in the city. For the latter, it creates both greater overall revenue and greater revenue yield per square mile of urban area. Redevelopment of areas like Core to Shore, restoration and full use of areas with depressed valuation, and incremental improvement of urban neighborhoods all serve the dual goals of improving life in the city and improving the City’s ability to provide the excellent services citizens expect and deserve at affordable cost. We will consider ways to make the tax structure more stable, resilient, and balanced. The City will explore and evaluate options such as greater flexibility in tax sources that can fund City operations, reducing unnecessary tax exemptions, considering sales or marginal taxes on some types of goods and services, and taxing on-line sales. Identify the economic value of cultural resources in attracting tourism and reinvest a share of tourism revenue to sustain and expand these resources. Increasing the proportion of G.O. Bond money spent on street maintenance over past levels. Changing state law to allow property taxes to be used for local government operations. Reducing the number of sales tax exemptions (which have increased in recent years). Increasing the number of basic services subject to sales tax. Taxation of internet sales to regain lost revenue while restoring the competitive imbalance suffered by local retailers. Enhancing the stability of the local economy by supporting economic diversification. Implement, support, and enhance the Vacant and Abandoned Buildings initiative. Improve maintenance of existing infrastructure. Increase urban intensity where appropriate to encourage infill and neighborhood revitalization. Strengthen and expand existing regional retail destinations. Continue to pursue one-in-the-market retailers with potential to attract shoppers from the entire metro area. Partner with Penn Square regional node property owners to develop a plan for retail expansion of the node. Plan for one new regional retail node in the city by 2030. This node should be planned for the downtown area in concert with efforts to attract a lifestyle or mixed-use town center. Attract another Hispanic-focused supermarket to serve the area south of I-40. Actively seek a natural foods grocer to serve the Midtown and Deep Deuce neighborhoods. Reaffirm, revitalize, or re-vision existing retail nodes and corridors by following the recommendations for each node or corridor in the Retail Plan. Hastening the creation of a fair and simple way to appropriately tax online purchases.